Bed bug infestations have been on the rise for the last several years. These insects were thought to be erradicated from the United States but have recently made a comeback. 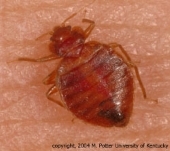 Bed bugs were first noticed at international ports of entry such as New York City, Cincinnati, and Los Angeles. Hotels and extended stay buildings first noticed the resurgence of bed bugs. Surprisingly to some, high class and five star hotels were having problems with this pest. Now local, national and international travelers are potentially exposed to bed bugs when spending a night at a hotel or motel. Bed bugs are commonly associated around beds and bedding. These insects are elusive creatures that typically feed at night. Bed bugs prefer to feed on human blood but will feed on other warm-blooded animals as well. Bed bugs are not known to transmit disease but a reaction (itchy, red welts) to their bite is normal. Bed bugs like to travel and will hide in suitcases, boxes and other items to be near a food supply. With the increase of human mobility and travel along with little or no quarantine programs by governments, bed bug populations have spread quickly. It can be extremely difficult to eliminate an established bed bug infestation. A bed bug infestation is not a sanitation problem by itself. Unlike cockroaches, these insects do not thrive only in poor sanitation areas. Bed bug infestations are seldom controlled in a single visit. POW Pest has the professional knowledge and experience to identify and treat for bed bugs. The initial inspection and treatment often take several hours to complete. Additional follow-up inspections and treatment are often required along with client/tenant cooperation. Choose the company that has great attention to detail and thorough effort to provide relief from these unwanted pests. Contact to schedule a bed bug consultation and estimate!